With The Lord of the Rings game, you allow yourself to get swept off with Frodo on his famous adventure to Mount Doom. You will battle through some of the most iconic events of the Lord of the Rings trilogy and take on the responsibility of the destruction of the One Ring. If you succeed, Middle Earth is saved. If you fail, all of Middle Earth is doomed to darkness. Are you up for the challenge? The Lord of the Rings is played in a sequence of conflicts. Players take turns, beginning with the ringbearer and going clockwise, and whoever is the active player takes the following steps. First is to reveal story tiles. The icons on the tile are resolved and then the tile is discarded. This action is continued until a tile showing an activity symbol appears (friendship, traveling, hiding, or fighting), or until the conflict ends. When an activity marker is revealed and advances the corresponding track, you may play up to two quest or legendary cards from your hand, draw cards, or move the active player’s hobbit one space away from Sauron on the corruption track. A conflict is completed when either the activity marker on the main track reaches the last space or the last event space on the event track has been resolved. 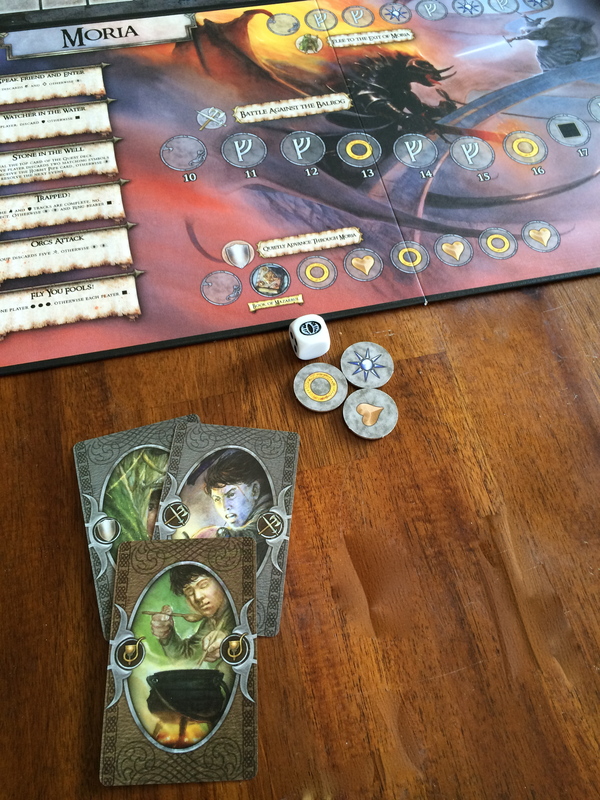 At the end of the conflict, each player must have at least one of each life token (heart, sun, and ring). 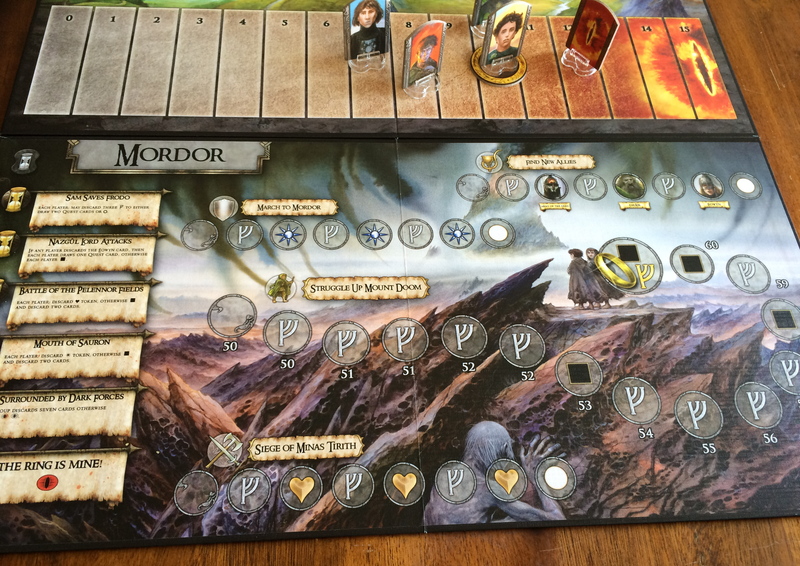 For each token missing, that player’s hobbit marker is moved one space toward Sauron on the corruption track. Be sure to use you hand wisely and always have three life tokens! 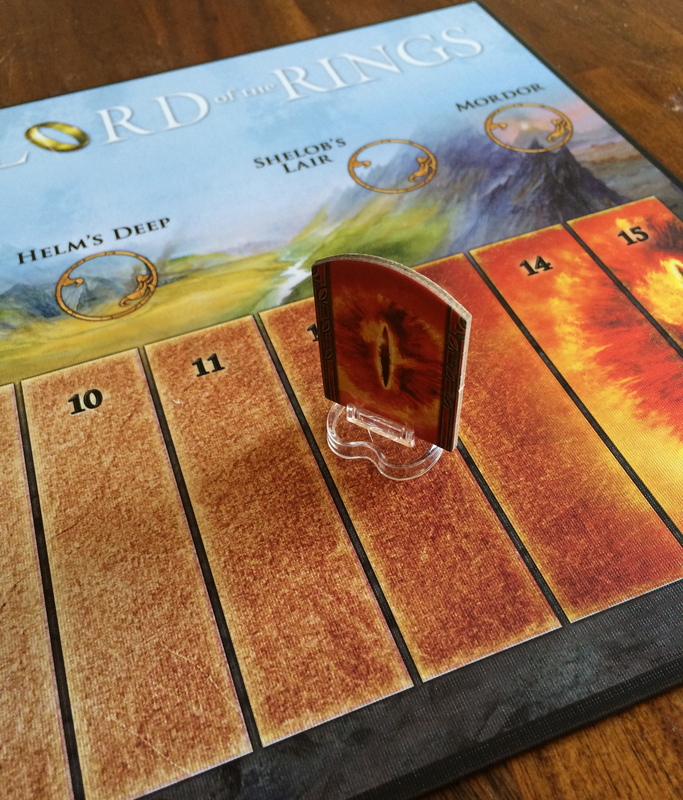 The game ends when the ringbearer is eliminated (by reaching Sauron on the corruption track), the “Ring is Mine!” event is resolved, or the fellowship destroys the ring. Only the destruction of the ring will lead to victory. The Lord of the Rings has always been a series near and dear to my heart. Summers were spent as a family listening to my mom read them out loud, her words weaving images of Middle Earth that no TV show or movie could ever compare to. Happy memories such as these were what spurred my love of reading, with Tolkien’s tales high on the list of my favorite stories. Nothing like giant spiders in the way of your nice walk into Mordor! With The Lord of the Rings game, you are part of his epic journey through Middle Earth. You must defeat Sauron and stop the hordes of Mordor against insurmountable odds. It isn’t so much a game as it is an experience, and if you are a fan of the stories, you will be a fan of the game. Game play is on the abstract side, and I found that it did detract from immersing myself in the theme of the game. You can get caught up in moving the pieces and collecting the items and forget that it is part of an epic journey. I can see how some players may not be able to fully enjoy the game due to this. I found for myself that role-playing the characters, as well as having ambient music (the Lord of the Rings soundtrack comes to mind) in the background, did wonders in pulling myself and my group into the game. Creating the atmosphere in which we played was key to getting the most enjoyment. I have heard complaints that the game play is too linear, but I personally had no issue with it. I feel that linear is the only way this game could be set up. It follows the events of the trilogy, in order, so that you to get to relive those key moments of the stories. If there was any deviation from those events, the game wouldn’t feel true to the source material. Story tiles dictate the way you play, but doesn’t deviate from the order of the story. Since the game is set up as a series of incidents, they cannot be varied in any way. The game must be played from the beginning of the story through to the end. This does limit the replayability quite a bit as not much will change between different playthroughs. However, due to the difficulty, you will experience few wins and many defeats, and I found that I can play it multiple times without getting bored with it. Every time I lose, it makes the next win that much more satisfying. Either way, you get to play a great story. Mechanics of the game mesh well with the theme in order to provide tension to the players. You feel as though you are there in the story, and it is a race against time. 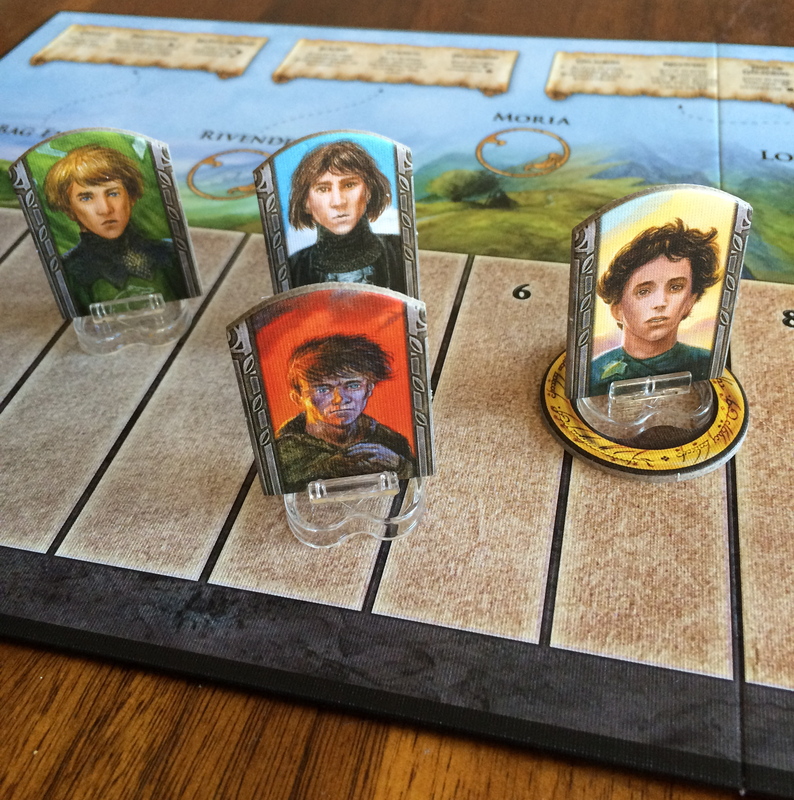 At the end of each scenario, each player must sacrifice a sun, heart, and ring or else they are moved that much closer to Sauron and defeat. I found this to be a clever mechanic as it encourages players to be cooperative. You will be more willing to help the other players get items in order to keep everyone away from Sauron. Fans of co-op games will love this aspect. Beware the lidless eye of Sauron! Even though cooperation is strongly encouraged, you will get more out of the game if each person keeps their hand to themselves and makes their own choices. Suggestions can be made to the current player, and can be helpful, but if you leave each player to their own decisions, it will make for a much richer game experience for everyone. It will also eliminate anyone who may be an alpha player in these situations. For anyone who is more competitive, there is a scoring system at the end of the game. You can use this to find out who “won,” but it is completely optional. You still win or lose as a team, and I found that everyone I played with was happier not using scores. 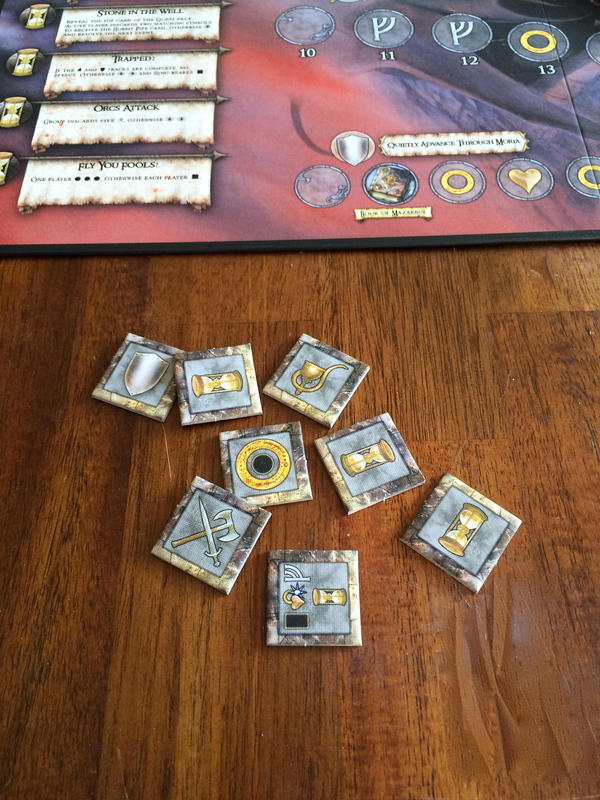 Components are simple and fit the vision of the game. It favors the story over any complicated bits. 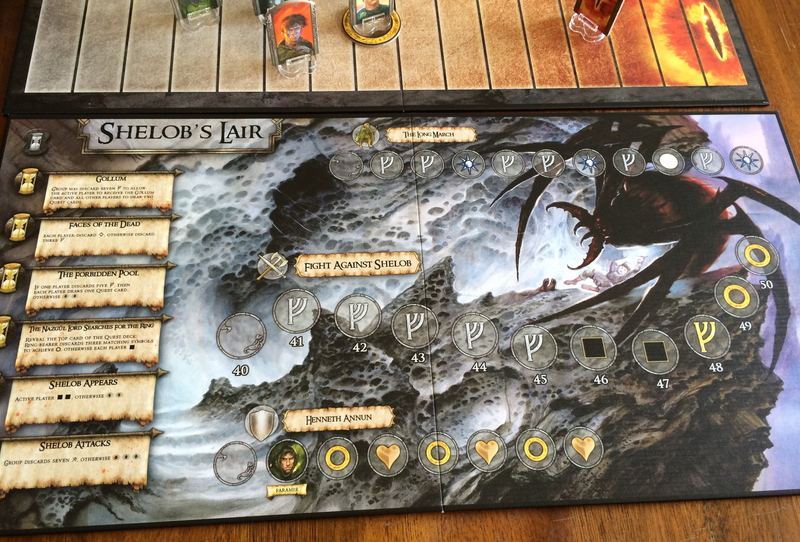 The artwork of the board is beautiful to look at and evokes a sense of actually being in Middle Earth. Don’t expect Elijah Wood or Ian Mckellen staring out at you, though; these are all original pieces of art. I loved how the boards all flowed together and worked minimal iconography into the play area. Player pieces and other collectibles are all made out of thick cardboard. No matter how many times I have played, I haven’t seen any warping or fraying on the sides of them. 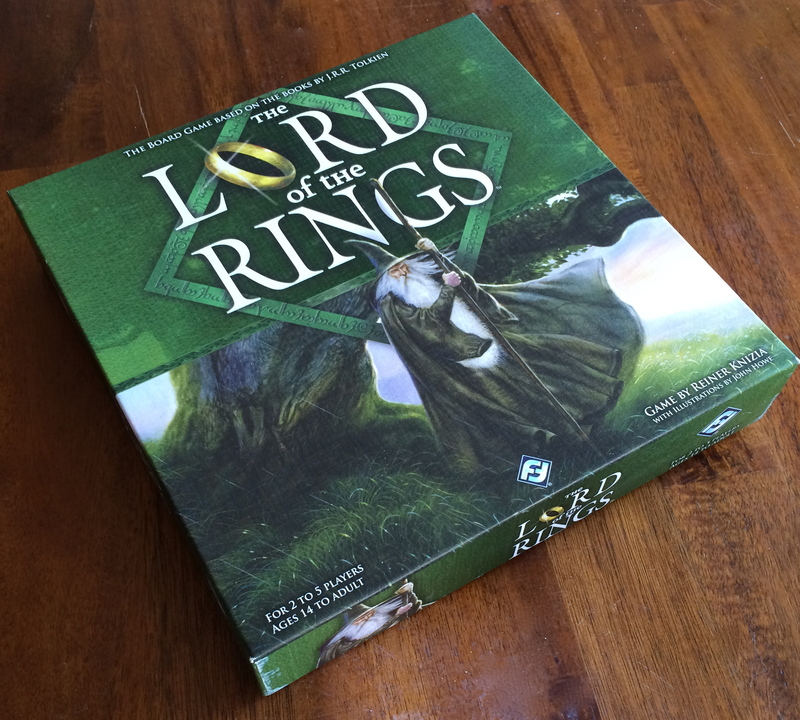 The Lord of the Rings is a spectacular game, with simple rules and components that evoke images and feelings as though you are actually on the epic quest bestowed on Frodo and his friends. Gameplay will not detract from the story, making it more of an experience than just going through the motions of play. It has something for every kind of fan, and is a classic that everyone should have on their shelf. Thematic when played in the right atmosphere. An experience rather than a game. Opens up conversation for various Lord of the Rings puns and quotations. Very difficult, you will have more losses than wins. Might be too linear for some.